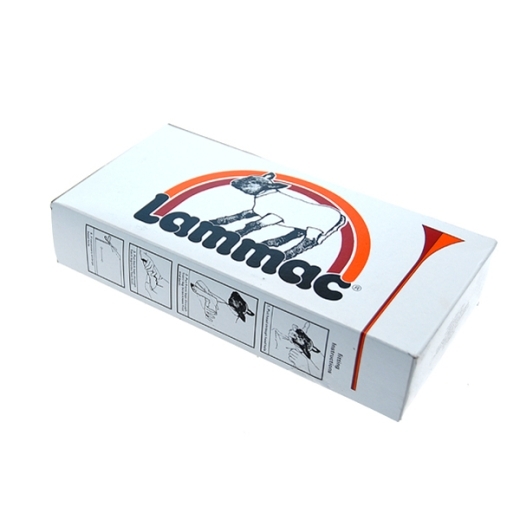 Lammacs are polythene jackets which provide protection against the elements for a newly born lamb and help prevent hypothermia which is the major cause of lamb mortality in temperate regions such as the UK. Hypothermia suppresses the suckling instinct of the lamb and any protection against this can help reduce lamb losses. Extreme winter temperatures together with wind and rain can spell disaster for the sheep farmer. Lamb loses due to these cold, wet conditions pose a threat to sheep farmers. Lammacs are made from polythene film which is degradable in ultra-violet light. This is an important environmental consideration as most hill lambing flocks are situated in National Parks and Areas of Outstanding Natural Beauty. Lambs usually shed their Lammacs after about three days and the jackets will then dissolve under natural light over a period of about five weeks. Lammacs are designed to ensure the ewe can smell and identify her own lamb. Mis-mothering is not a problem.